Commonly, we discuss how to better manage your personal productivity through the effective use of task lists. Today, we discuss a counterintuitive productivity concept that Augusto Pinaud has been using for many years–the “Do-Not-Do” List. In this way, this is another use of task lists but, in this case, it’s a way to identify what you shouldn’t do. 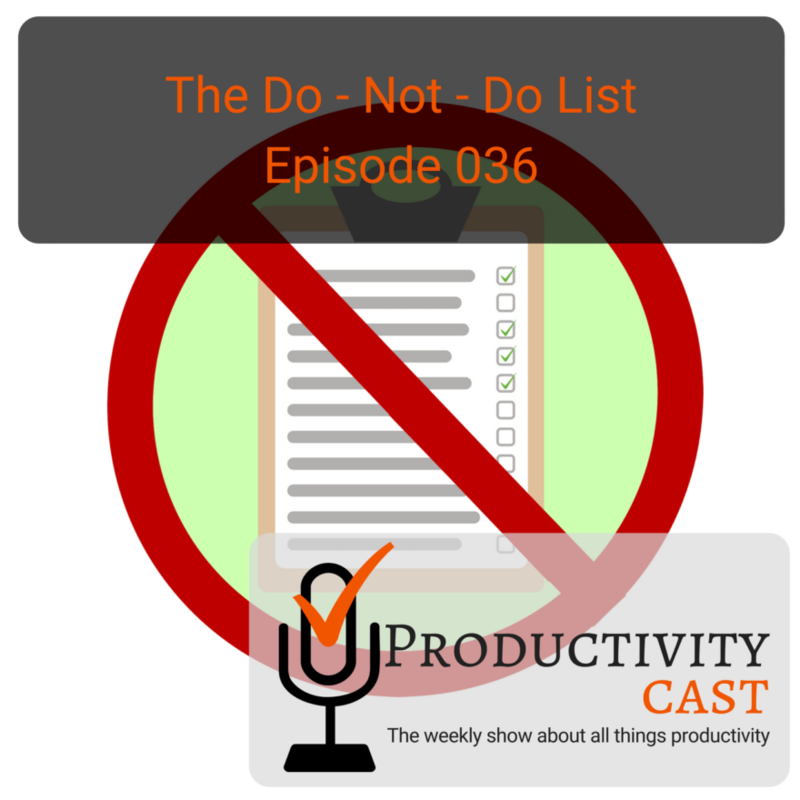 In this episode of ProductivityCast, we discuss the idea of the Do-Not-Do list and how you might use it in your personal productivity system. Enjoy! Give us feedback! And, thanks for listening! If you’d like to discuss this episode, please click here to leave a comment down below (this jumps you to the bottom of the post). Resources we mention, including links to them will be provided here. Please listen to the episode for context. Raw, unedited and machine-produced text transcript so there may be substantial errors, but you can search for specific points in the episode to jump to, or to reference back to at a later date and time, by keywords or key phrases. The time coding is mm:ss (e.g., 0:04 starts at 4 seconds into the cast’s audio). Are you ready to manage your work and personal world better to live a fulfilling, productive life? Then you’ve come to the right place productivity. Cast, the weekly show about all things productivity, hear your hosts, Ray Sidney-Smith and Augusto Pinaud with Francis Wade and Art Gelwicks. Welcome back everybody to productivity cast, the weekly show about all things personal productivity. I’m Ray Sidney-Smith and I am joined here today, as usual by Augusto Pinaud, Francis Wade and Art Gelwicks. Good morning, gentlemen. Good morning. Hey, guys, great to have you all here. Today, we are going to be talking today about something called the do-not-do list in deference to not messing up what this very vital productivity tool can be to you. I’m going to pass the microphone over to a goose. Joe okay. So do you want to explain to our audience a little bit about what the do-not-do list is and and how it functions. And then we can get into conversation about how it might be practical in a productivity system. Yes. in some of those cases, hopefully, ever. So let me let Yes, they answer The answer, obviously, like, like a lot of these answers a little bit more complex than that. So let me see, if I can give you a couple of examples of my list that then we’ll we’ll give you a better idea. Okay. And I’m going to the first six, I can give you multiple, but I’m going to give you one that is controversial. Okay, years ago, my main tool since 2012 has been the iPad, that’s my main machine. That’s what I take every day with me and I begin receiving email on my phone before that what I learned receiving email in my one of the items on my do not do list is I do not check work email on the iPhone, okay, obviously was on the iPhone, when I discover that what I was doing was constantly opened my eyes, my iPhone, checking email, seeing if there was anything just to not do anything about it, I eventually way don’t like it back to the iPad, and then do something, file organized, defined actions, whatever it was. So what I notice is, well, I’ve been extremely inefficient here because I’m opening this email inbox checking things three or four times when really there is nothing to do with it. So when I identify that I say you know what it is behavior me to stop so I want to put on my list I do not check work email and even when as far as the activate their work email on on my phone. And and actually remember, you and I were exchanging some information you may send it to you via email is that Oh, sorry, you need to send it to this special email, there is one special email that I only received from the phone and he’s the only one to receive on the phone, you know, it’s a private email, my wife have it, you have it, I think he’s a total of 10 or 15 people. I don’t want to receive anything on the email. That’s one example that I can give you another example, I do not test productivity tools that that cannot be backed up. Okay. Part of what I do as a writer and as a coach is testing productivity tools. Because sometimes I get customers who call me and say, Hey, I will love to move to travel, what I can do about travel. And you’re like, Oh, I don’t know, I don’t know anything about trailer. So you come and play and sometimes that plane require me to move for some days for a week. So I really understand how this tool works. And I have come to a rule for me as well for my clients. If the tool cannot be backed up. That’s not a tool you want to move. Because if that tool fail, you lose everything and all the effort and all the time you have put in there. So those are two examples that come into this. They are not necessarily big things, but there are things that allow me to keep in a more consistent trend of productivity, what comes to mind is not I don’t think I have a written list, but I certainly have a thought of an experience of people that I don’t want to hang out with the film degree. it will depend how long your list is or not I have I have a one that I call the do not need lives get that really is part of the do-not-do list because he’s you know it’s things for example once in a while I get this idea that I should get or used to before before they the iPad pro athletes that I should go and get a planner and paper because I really wanted to play with paper okay and eventually see this is ridiculous you go play was a paper remember that you get you know I’ve strong reminder of why paper doesn’t work for you but you have to spend you know a ridiculous amount of money because you like good paper So eventually I put on my list I do not buy paper stuff because as much as sounds incredibly as soon as I implement that doesn’t work and I call it part of my do not need to least things I do not need that are there is a subset of these do-not-do list and what Francis is doing is great except he’s not writing it down and the reason I believe you should write it down is because that way you have less chance to be full by your own self you know when when Julia right the things really specifically you are less prone to romanticize what is happening there or you are going to say you know what this guy fit every requirement this list and regardless, I’m going to go against my list when that thing is on your mind do tend to play with that in a much more easier way. Because now you are negotiating with any proof that he’s never good. You know, like like that. I can give you another example that works for for a lot of people that he’s on my do-not-do list. I used to struggle for years to wake up early. Okay, even understanding the power of waking up early I struggle term, you know, when the alarm sign at four in the morning is like, Oh, my five more minutes. Okay. And well, everybody knows what happened after five more minutes. So after struggling with this for a little bit, I say okay, this is getting ridiculous. I kind of wake up and I need to wake up at that time. there is no negotiation at that time. I got 4am. If I said the night before, it’s 4am. When that alarm sound. There is not five minutes there is not Oh, it’s you know, it’s cold, or I’m tired. Or my or I asleep crooked. And then my back hurt. Not too bad. Sorry, dude. You know, tomorrow, you can you know tonight, you can negotiate for tomorrow. But you cannot negotiate in the morning. And what that did was increased. My rate of success was waking up at four in the morning that then bring me an incredible set of results on things that I accomplished that I knew it was going to accomplish. I was just struggling terribly with the idea of waking up that early. other thing though, is I found that I often will forget that I’ve done that because I’ve completed that action. And I’ve looked at it, I’ve analyzed it, I’ve decided Yep, that’s cool. But I don’t actually make the purchase. And I go back 234 weeks later. And I look at that list. And I go, what the heck was I thinking about getting that for. So it’s the same type of a behavior, you’re, you’re capturing the idea, the issue the topic, in this case, the thing in the shopping cart, you’re mentally processing it. And you’re deciding that you know what, I don’t ever need to do anything with this. This is not not necessarily actionable. But you still need to close that loop. And I for me, that’s the best example of doing it. I don’t do it with my normal to do lists, I find those are actually a little bit more difficult, because when I put something on my to do list, I’m hesitant to take it back off. I don’t know why. It’s it’s kind of a brain thing. But I am hesitant to take it back off. So I look at it and say, okay, maybe I’ll slide this around here. Maybe I’ll move this around there and eventually gets to the point where it’s been on the list so long, it’s like, you know, it’s not getting done, it’s got to come off. So maybe I’ll tackle prioritization to help with the do-not-do list part of it. But that’s the closest I have to something that I currently do all the time. So, so how I’m understanding this, and I’m repeating for my own edification here. And I and I think listeners will hopefully appreciate that which is, as I’m hearing it, I’m thinking about the the reality that like a to do list task list or even a shopping list by reducing its prioritization and your case, adding it to a wish list, you’re creating some level of balance right? The space between stimulus and responses as Dr. Victor Frankel and Dr. Covey expanded upon is, you know, space between stimulus and response is control, creating some distance between what triggers you to do something and what you’re going to eventually do gives you perspective and control on that thing, maybe when you feel like you’re going to do something you don’t want to do and you’re triggered by that creating a list that you can then sort of track as maybe I don’t, it’s sort of like when I write an angry email I write my more of them than I that I care to care to admit but but I but I write angry emails on occasion and then I save them to draft a couple hours later I look at that email I go Okay. That person did not mean probably what they said and or you know, I’m just you know, I was in a bad mood and and then I redraft that email and now it sounds less crabby. Right? It sounds less grumpy from me. And then I go along. So, I could potentially have a list of things of like, okay, these are triggers. So when when I’m triggered by these things, let’s defer them to a list in this case, my draft emails is a list and and park them there for some period of time is that is that kind of where I’m where you’re coming from art? Well, there’s, there’s an approach to it tied to the prioritization of tasks where you look at, you know, priorities, if I think about to do is it’s got priorities one through four, if I remember correctly, and if you bump it all the way down to the bottom of that priority structure, you’re basically saying, I’m probably never going to do anything with this. It’s the same mindset. The only problem I get into with this whole approach is, and this is this is nothing criticizing on on what a goose does lining out, because I think it’s a it’s a great way to handle these kinds of things is I can see the pushback on how much effort are you putting into managing, managing and administering the things that you are blatantly saying you’re never going to do? Is there too much work for no return? I’m not sure. Um, it’s more of a question than an answer. why am washing the car instead of taking it to whatever carwash a decent town that was the moment I said, You know what, this is not worth it. Because it’s not the 20 minutes of washing the car. It is I get mad before because I need to wash the car. I get mad for 20 minutes into the job. And then I get mad for another hour until I forget that I did the job. It’s not worth it. And that was one of the first item on that list was I will not wash my car ever again. And it was such a liberating thing. Because was the first time I gave myself permission not to do that task that makes no sense at all that it really the cost benefit relationship wasn’t even proportional. Because he wasn’t the 20 minutes and was it two hours I spend mad before and after. Other thing that I came to that list early on in the game was if I do not if you call my cell phone and I do not recognize the number or the number is on identified you’re going directly to voicemail. If it’s an important message on you are not a telemarketer you are going to say hey it’s art call me back my number is 5555555 great then I will call you back but if your number he’s not in my list I’m not even going to waste time entertaining myself what this item on the do-not-do lists give me was get read out dramatically of the guilt that was associate at some point for me of my phone ringing looking at the number and saying Should I pick Oh, it’s a number in Indianapolis. And maybe something interesting now. No, I it’s part of the rules is if you don’t know the phone number directly to their voicemail, they can leave a voicemail if it’s important. And I will go back and I may check the voicemail immediately. But instead of be two minutes of all this this Mr. Peanut now Mr. pinatas. My dad, he’s not here. Okay. I kind of avoid old dad and then just listen to the voicemail. is always keep it simple, okay, no, you don’t need to have 30 items list or it can be a one item. But pay attention to two things, you know, what are the things that usually the things tend to be part of your routine and tend to bring a high emotional component. So, you know, as Francis was sharing, you know, well, I was noticing I was spending a whole day you know, doing this backyard thing. Well, I guarantee you, without knowing that I then that day, Francis wasn’t feel proud about the fact that he waste a whole Sunday or Saturday or day, okay, doing the biker, it was the other way around. He was frustrated. So pay attention to the that emotional component. Okay, one second, pay attention to when you get frustrated. And there is a difference between the emotional components and the frustration. frustration is a really specific one. Because a lot of times those frustrations, what it means is you are doing something that a you should not do or beat you should do in a different way. Or see you should pay somebody to do that is fine. Okay, pay attention to those two elements. And let the list come organically. Yeah, my list has probably 10 items. It’s not that long, but hasn’t come in a day has taken me a while. As soon as you identify the first one, then you will find others that will come that should come in there. You know, I have one I have mentioned a couple that I have on my list. And I have one that says I do not finish a book that I do not enjoy after more than 25% of the book is read if is if I’m not enjoying it, I just dump it you know, I I’d read over 60 books a year. And for the longest time, I will need to finish the book. And what that did was it slowed down my reading process because I look at the book and so I don’t want to read this is Jennifer. I’m not getting into the book or I don’t enjoy the book and then took me forever to finish the book. And I want some point I Steve Levine from 11 year mentioned a comment about dropping the book. And I say that is true why I’m if I’m if there’s so many books out there. Why am suffering through this book that I’m not enjoying. And I went to my to do list. Think about it and say, You know what, from now on every book, I have rich 25% of the book and if I’m not enjoying the book out and by the way, if you’re reading one of the books I have wrote on you’re not enjoying it, please dump it. You know it is works everywhere. it’s not only about actions. It’s also about things it’s also about again, do you need to understand what makes you productive and what you need to stop doing. Because he dropped you out of that productivity part, you know, for me spending an hour to research and convertibles not I should not buy. Because I will not enjoy. It’s not the best use of my time. So having that list and having that item in that list. Remind me immediately. Nope, this is a decision we make long time ago and have the decision and I can move forward instead of spending the hours on maybe going to the dealers and maybe test drive compatible. So it sounds to me like there’s a little bit of reflection that can be done from things that are emotionally negative for you. And figuring out those things that you do not want to do in the future because of them. And then it also sounds like there can be some contemplation about about forecasting things that would not be healthy for you to do in the future. And at all. You know what I mean. So I know that I’m not built for, you know, yard work to continue Francis’s story from earlier. And so, you know, not that I’m incapable of doing it. But I know that there are just things that are more important for me to spend my time doing. So that’s going to naturally be something that I’m going to think about. So from my perspective for, for the listening audience, what what I would do and what I do do is immediate things immediately think of things that I should not be doing that we’d be wasting my time, in essence, or causing me great emotional distress, right, as an as an acoustic story about, you know, cleaning the car, go ahead and create systems put systems in place so that you don’t have to do them right, either through automation, you know, creating greater efficiency first, you know, automation, then potentially delegating that to someone else, whether that be you know, someone in your family in a use case, you could pass it pass the torch down of cleaning the car to one of your children. and said about the emotional for the emotional trauma being the reason why you’re one of I’d probably do-not-do this, I just started my own not doing this clearing keep after several years of not having one I’m inspired by what he said. And I, I have I just identified one that I have, that’s a difficult one to me. And it’s the stop speaking when someone else’s typing. and then having the courage to engage in this brand new habit, which is the same as not engaging in the old habit. But it’s that courage to go it when it’s difficult when you’re trying to impress the client and meeting them for the potential plan to return them for the first time and the engage and in this behavior and sticking to your guns in that moment. It’s a I don’t have any bad experiences to share from from doing this. But there are others that are a little bit like that where I have to confront the clamp double somebody’s behavior that are also more difficult. But the courage I think, is essential, it’s essential to overcome emotional trauma and have it repeat itself. Yeah, I just looking at this whole process. And I think there’s there’s a great deal of value to this. I think everybody’s going to have to approach this one. Personally, I don’t know that there’s a a clear guidance that can be provided to say this is how you take your stuff and sub divided into what not to do what to do. And you’re going to have to go through this one kind of trial by error or trial and error and get a sense as to how do you feel most comfortable sloughing things off of what you’re doing. It’s a really critical thing to do, though. And I think all of us need to put a little bit more effort into making sure that we’re doing the correct things that a tagline I use all the time is productivity is doing the right thing at the right time in the right way. And I think this absolutely Mary’s to that. I would agree this is a very personal process and and requires reflection and planning so that you are capable of doing it at the same time it hearkens to for me in the getting things done, or GTD weekly review. This is this is the time in which I am looking at my system and looking at things that are inefficient or you know are competing with my responsiveness and or if my responsiveness is competing with my effectiveness and and dealing with the things that I will and will not do going forward. Thank you everybody for this conversation. Do you have any questions or comments about this episode, something we discussed in the cast or otherwise about personal productivity please visit productivity cast dot net forward slash contact and let us know thanks to a gusto, Francis and art for joining me here on this cast. You can find this episodes, show notes and the links to anything that we discussed and how to subscribe there at productivity cast dot net forward slash 036. That’s the episode number 036. And if you could feel free to leave a rating or review in iTunes to help us grow our personal productivity community of listeners like you. So thank you. That brings us to the club. This episode of productivity cast the weekly show about all things personal productivity, I’m Ray Sidney-Smith and Augusto Pinaud with Francis Wade and Art Gelwicks, here’s your productive life. And that’s it for this productivity. Cast. The weekly show about all things productivity with your host race, Ray Sidney-Smith and Augusto Pinaud with Francis Wade and Art Gelwicks.